Another nervy, edgy performance by Wigan Athletic on their home ground. The end result a 2-2 draw with newly promoted Southampton. The visitors dominated the game so much that they looked like the home team. Why were Latics not able to stamp their authority against a team short of Premier League experience, whom they had already beaten in August? Why didn’t Wigan put them under pressure from the start? So far this season Latics have a woeful record of W2 D4 L7 at the DW Stadium. The wins came against West Ham and Reading. So why are Wigan not a greater force to be reckoned with on their home ground? Since joining the Premier League Wigan Athletic have an aggregate home record of W46 D43 L57. In fact only in two seasons have they won more matches at home than they have lost, both during Steve Bruce’s reign between 2007 and 2009. Even in that wonderful Premier League debut season of 2005-2006, under Paul Jewell, they lost more than they won at home, although their away form was excellent. It was in Latics’ second season in the Premier League that they gained the least total of points at home, with just 19. Martinez’ teams gained 22 home points in 2011-2012, 23 points in 2010-2011, and the best being 25 points in 2009-2010, when they won as many as they lost at home. Steve Bruce had some simple strategies that worked during his brief tenure in the Premier League with Wigan. He produced teams of iron, with a combative and aggressive midfield providing cover for the defence. He did not worry too much about results against the top clubs, but stressed the importance of good performances against teams nearer the bottom. But more than anything else his teams performed well at home. Figures sometimes don’t tell a true story, or should I say that results don’t always paint a true picture of a game? Too often this season the picture has been Wigan playing good football, but being undone by individual or collective errors. Sometimes they have been plain unlucky. Injuries have reaped havoc and the team has played all season without a settled defence. Critics would say you make your own luck and that Wigan go into matches without a proactive approach, paying too much respect to the opposition and only rallying when going behind. For what reason did Wigan not put the pressure on Southampton in the opening part of the game? Was it due to a lack of confidence or a tactical approach that did not work? In order for Wigan to stay afloat this season their approach needs to be more proactive, less reactive. 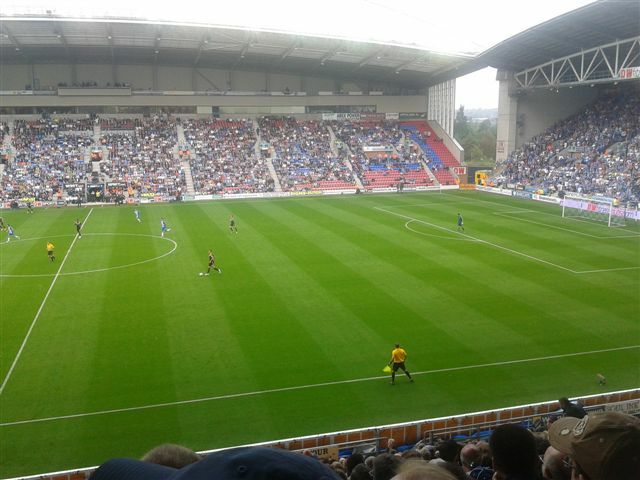 Last season Wigan Athletic drew one and won four of their last five home games. Crowd support was a key factor in their resurgence. Latics now have only six home games left this season – with Liverpool, Newcastle, Norwich, Swansea, Tottenham and Aston Villa coming up. It is to be hoped that their home form will have improved sufficiently by then to make that final match with the Villans a meaningful encounter. The DW Stadium needs to become a ‘Fortress Wigan’ if that is going to happen.